← A Man Purse: Deal Maker or Breaker? Do You See Monsters Kissing? 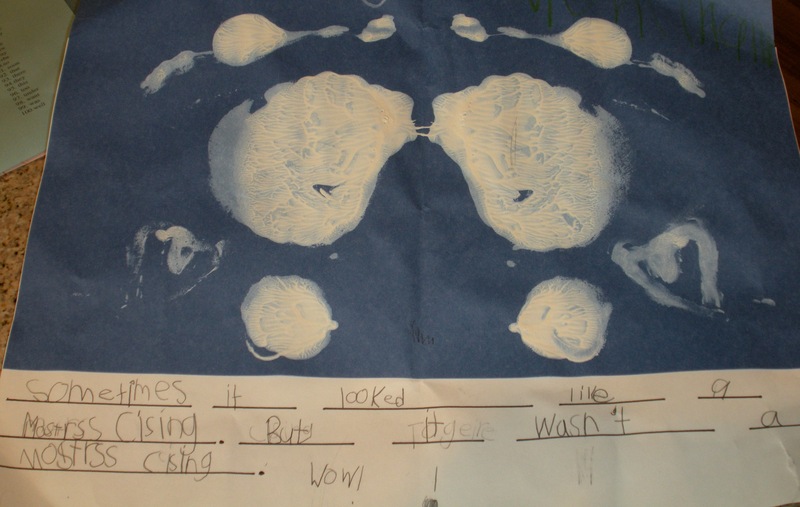 Did you know that the Rorschach (pronounced EENK-blaut) test is being administered to kindergarten students these days? Psychoanalysis of young children has come a long way since my days in the “K” when teacher comments (“A very nice boy. Eats a lot of boogers. You may want to consider velcro shoes. For life.”) were the only indicators parents had to reassure them that their kids were progressing (stagnating) on the correct developmental arc. For those unfamiliar with the Rorschach, subjects are shown a series of images and asked to describe what they see in each. Here are some examples. For instance, a person looking at this image will most likely identify two garden gnomes inexplicably high-fiving after having their lower legs sheared off by a lawnmower. Most reasonable individuals will view this picture and immediately spot a unicorn tripped-out on peyote and dressed in drag. When gazing at this slide, 87% of respondents describe two women with compound fractures of the femur dead-lifting a keg of beer while holding their handbags. And if presented with this rendering, there is near-universal agreement on “mutated Chicken McNugget,” with “old man scrotum” coming in a close second. Five-year-old KM just might grow up to be one of those people who gets paid big bucks to tell others how crazy they are. She seems to have a pretty good handle on the analysis part. Thanks to KM’s mom for submitting this piece, knowing full-well that I would bring up her and her husband’s tendency towards public displays of affection and the lasting efffect (scarring) it will likely cause on their daughter. Posted on June 16, 2011, in Miscellaneous and tagged Chase McFadden, funny, funny writing, Humor, Inkblot images, Ironic Mom, kid writing, Kids, Leanne Shirtliffe, Rorschach test, Some Species Eat Their Young, Stuff Kids Write, Stuffkidswrite.com. Bookmark the permalink. 10 Comments. It totally DOES look like monsters, kissing! This site just gets better and better! I see the gnomes in the first one. In the 4th one, I see a bat…because I’m Batman. Very funny. First thing I saw was marshmallow creme smeared on a blue sofa. In that last one I saw the Johnny Depp lizard Ringo looking at me. ………I see a lot of entertainment value in this test.